The Miracle Method - Description | W. W. Norton & Company Ltd.
A new approach to problem drinking that focuses not on the past or the present but on the future. Your spouse complains about your drinking. Your boss suggests Alcoholics Anonymous. You know you have a problem. You need a solution; you need a miracle. The authors ask readers to imagine such a miracle: Suppose that while you are asleep tonight a miracle happens and your problem is solved, just like that! Because you were sleeping, you didnt know that this miracle occurred. What is the first thing tomorrow morning that will let you know that there has been a miracle and that your problem is solved? From that "first thing," the authors help readers to imagine a future where drinking is not a problem and to specify small, concrete, obtainable goals that will make that future a reality. Neither the humiliation of "hitting bottom" nor a lifetime commitment to AA is necessary to make this approach work. Instead the individual learns to recognize exceptions (times when drinking is not a problem), catch himself "doing things right," handle setbacks, and revise the "miracle picture" when things arent working. 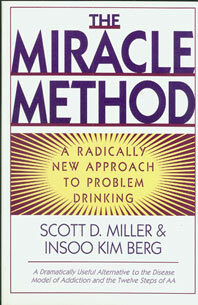 Highly practical, The Miracle Method is a radically new and effective approach to problem drinking. How to use solution-focused therapy with children and adolescents.